I can't say that I'm surprised to hear that many near-adult teens who are nearing the completion of years 11 and 12 are not in the least bit interested in Australian politics. I remember when I was in school that politics was a unit of study in year four and then again in year nine or ten. As I recall, it was one of the more loathed topics for most students and most students weren't particularly interested in the day-to-day goings-ons of parliament at the federal or state level. It would be fair to say that the US Presidential election was something which interested more students than domestic politics, but only during the month or two before the election, and probably only because it is in many ways portrayed by parts if the media as a far-away celebrity event rather than a serious event with many implications and consequences. I remember in high school that politics formed part of the Social Studies course…I did absolutely nothing in this course other than draw pictures and set up an office at the time out desk, but I took a strong interest in the politics unit and put a lot of effort in to the assignment of producing policies for my own political party and speaking to the class about them. It was supposed to be a five minute speech, but mine went for 45 minutes, much to the surprise and consternation of the teacher who wanted me to stop talking, but didn't cut me off as he seemed to just be glad that I had finally showed an interest in something in his class. Alas, participating eagerly in a two week unit of a semester-long course was not enough to prevent me from failing. Anyway, as someone who was very interested in news and politics (I brought a radio to school with me so that I could listen to 2CC during recess and lunch), it was very clear to me that most of the rest of the student population was not remotely interested. There was a brief peak in interest when the Iraq war started, but it was brief, and afterwards most students returned to other interests. Those who were genuinely interested in politics were either interested and informed, or merely indoctrinated by Greens bumper sticker slogans. The latter category, sadly, outnumbered the informed people who understood why they believed what they believed. In adult life, I have found that more people are interested in politics and at least somewhat informed, but then I also encounter people who could not care less and, come election time, horrify me by being completely unable to name party leaders or which party is currently in government. For these reasons, I disagree with any move to lower the voting age below 18 as this would result in the majority of the extra votes being based on indoctrination rather than information, and I also support voluntary voting as I think it is wrong that people with no interest or understanding of politics are forced to vote, and have their vote cancel out the vote of someone who actually does care. At least with voluntary voting, you know that the outcome is a result of the votes of people who actually know for whom they wish to vote, and why they wish to do so. Completely off-topic, please find attached a photo of something rare. 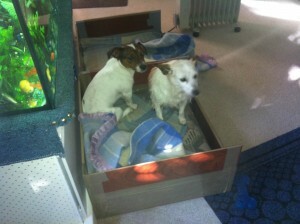 My two dogs Nattie and Pebbles voluntarily sharing a bed, albeit for a short period of time. Have a wonderful morning John, and an equally wonderful week.